"von Bismarck" redirects here. For other uses, see Bismarck (disambiguation). Otto Eduard Leopold, Prince of Bismarck, Duke of Lauenburg (Born von Bismarck-Schönhausen; German: Otto Eduard Leopold Fürst von Bismarck, Herzog zu Lauenburg; 1 April 1815 – 30 July 1898), known as Otto von Bismarck (German: [ˈɔtoː fɔn ˈbɪsmark] ( listen)), was a conservative Prussian statesman who dominated German and European affairs from the 1860s until 1890 and was the first Chancellor of the German Empire between 1871 and 1890. In 1862, King Wilhelm I appointed Bismarck as Minister President of Prussia, a position he would hold until 1890, with the exception of a short break in 1873. He provoked three short, decisive wars against Denmark, Austria, and France. Following the victory against Austria, he abolished the supranational German Confederation and instead formed the North German Confederation as the first German national state in 1867, leading it as Federal Chancellor. This aligned the smaller North German states behind Prussia. Later receiving the support of the independent South German states in the Confederation's defeat of France, he formed the German Empire in 1871, unifying Germany with himself as Imperial Chancellor, while retaining control of Prussia at the same time. The new German nation excluded Austria, which had been Prussia's main opponent for predominance among the German states. With that accomplished by 1871, he skillfully used balance of power diplomacy to maintain Germany's position in a Europe which, despite many disputes and war scares, remained at peace. For historian Eric Hobsbawm, it was Bismarck who "remained undisputed world champion at the game of multilateral diplomatic chess for almost twenty years after 1871, [and] devoted himself exclusively, and successfully, to maintaining peace between the powers". However, his annexation of Alsace-Lorraine gave new fuel to French nationalism and promoted Germanophobia in France. This helped set the stage for the First World War. Bismarck's diplomacy of realpolitik and powerful rule at home gained him the nickname the "Iron Chancellor". German unification and its rapid economic growth was the foundation to his foreign policy. He disliked colonialism but reluctantly built an overseas empire when it was demanded by both elite and mass opinion. Juggling a very complex interlocking series of conferences, negotiations and alliances, he used his diplomatic skills to maintain Germany's position and used the balance of power to keep Europe at peace in the 1870s and 1880s. A master of complex politics at home, Bismarck created the first welfare state in the modern world, with the goal of gaining working class support that might otherwise go to his Socialist enemies. In the 1870s, he allied himself with the Liberals (who were low-tariff and anti-Catholic) and fought the Catholic Church in what was called the Kulturkampf ("culture struggle"). He lost that battle as the Catholics responded by forming a powerful Centre party and using universal male suffrage to gain a bloc of seats. Bismarck then reversed himself, ended the Kulturkampf, broke with the Liberals, imposed protective tariffs, and formed a political alliance with the Centre Party to fight the Socialists. A devout Lutheran, he was loyal to his king, who argued with Bismarck but in the end supported him against the advice of his wife and his heir. While the Reichstag, Germany's parliament, was elected by universal male suffrage, it did not have much control of government policy. Bismarck distrusted democracy and ruled through a strong, well-trained bureaucracy with power in the hands of a traditional Junker elite that consisted of the landed nobility in eastern Prussia. Under Wilhelm I, Bismarck largely controlled domestic and foreign affairs, until he was removed by the young Kaiser Wilhelm II in 1890, at the age of seventy-five. Bismarck – a Junker himself – was strong-willed, outspoken and overbearing, but he could also be polite, charming and witty. Occasionally he displayed a violent temper, and he kept his power by melodramatically threatening resignation time and again, which cowed Wilhelm I. He possessed not only a long-term national and international vision but also the short-term ability to juggle complex developments. As the leader of what historians call "revolutionary conservatism", Bismarck became a hero to German nationalists; they built many monuments honoring the founder of the new Reich. Many historians praise him as a visionary who was instrumental in uniting Germany and, once that had been accomplished, kept the peace in Europe through adroit diplomacy. Bismarck was born in Schönhausen, a wealthy family estate situated west of Berlin in the Prussian province of Saxony. His father, Karl Wilhelm Ferdinand von Bismarck (1771–1845), was a Junker estate owner and a former Prussian military officer; his mother, Wilhelmine Luise Mencken (1789–1839), was the well educated daughter of a senior government official in Berlin. He had two siblings: his older brother Bernhard (1810–1893) and his younger sister Malwine (1827–1908). The world saw Bismarck as a typical Prussian Junker, an image that he encouraged by wearing military uniforms. Bismarck was well educated and cosmopolitan with a gift for conversation. In addition to his native German, he was fluent in English, French, Italian, Polish and Russian. Bismarck was educated at Johann Ernst Plamann's elementary school, and the Friedrich-Wilhelm and Graues Kloster secondary schools. From 1832 to 1833, he studied law at the University of Göttingen, where he was a member of the Corps Hannovera, and then enrolled at the University of Berlin (1833–35). In 1838, while stationed as an army reservist in Greifswald, he studied agriculture at the University of Greifswald. At Göttingen, Bismarck befriended the American student John Lothrop Motley. Motley, who later became an eminent historian and diplomat while remaining close to Bismarck, wrote a novel in 1839, Morton's Hope, or the Memoirs of a Provincial, about life in a German university. In it he described Bismarck as a reckless and dashing eccentric, but also as an extremely gifted and charming young man. Although Bismarck hoped to become a diplomat, he started his practical training as a lawyer in Aachen and Potsdam, and soon resigned, having first placed his career in jeopardy by taking unauthorized leave to pursue two English girls; first Laura Russell, niece of the Duke of Cleveland, and then Isabella Loraine-Smith, daughter of a wealthy clergyman. He also served in the army for a year and became an officer in the Landwehr (reserve), before returning to run the family estates at Schönhausen on his mother's death in his mid-twenties. Around age thirty, Bismarck formed an intense friendship with Marie von Thadden, newly married to one of his friends. Under her influence, Bismarck became a Pietist Lutheran, and later recorded that at Marie's deathbed (from typhoid) he prayed for the first time since his childhood. Bismarck married Marie's cousin, the noblewoman Johanna von Puttkamer (1824–94) at Alt-Kolziglow (modern Kołczygłowy) on 28 July 1847. Their long and happy marriage produced three children: Marie (b. 1847), Herbert (b. 1849) and Wilhelm (b. 1852). Johanna was a shy, retiring and deeply religious woman—although famed for her sharp tongue in later life—and in his public life, Bismarck was sometimes accompanied by his sister Malwine "Malle" von Arnim. Bismarck soon adopted his wife's pietism, and he remained a devout Pietist Lutheran for the rest of his life. In 1847 Bismarck, aged thirty-two, was chosen as a representative to the newly created Prussian legislature, the Vereinigter Landtag. There, he gained a reputation as a royalist and reactionary politician with a gift for stinging rhetoric; he openly advocated the idea that the monarch had a divine right to rule. His selection was arranged by the Gerlach brothers, fellow Pietist Lutherans whose ultra-conservative faction was known as the "Kreuzzeitung" after their newspaper, the Neue Preußische Zeitung, which was so nicknamed because it featured an Iron Cross on its cover. In March 1848, Prussia faced a revolution (one of the revolutions of 1848 across Europe), which completely overwhelmed King Frederick William IV. The monarch, though initially inclined to use armed forces to suppress the rebellion, ultimately declined to leave Berlin for the safety of military headquarters at Potsdam. Bismarck later recorded that there had been a "rattling of sabres in their scabbards" from Prussian officers when they learned that the King would not suppress the revolution by force. He offered numerous concessions to the liberals: he wore the black-red-gold revolutionary colours (as seen on the flag of today's Germany), promised to promulgate a constitution, agreed that Prussia and other German states should merge into a single nation-state, and appointed a liberal, Gottfried Ludolf Camphausen, as Minister President. Bismarck had at first tried to rouse the peasants of his estate into an army to march on Berlin in the King's name. He travelled to Berlin in disguise to offer his services, but was instead told to make himself useful by arranging food supplies for the Army from his estates in case they were needed. 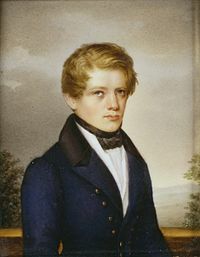 The King's brother, Prince Wilhelm, had fled to England; Bismarck tried to get Wilhelm's wife Augusta to place their teenage son Frederick William on the Prussian throne in Frederick William IV's place. Augusta would have none of it, and detested Bismarck thereafter, despite the fact that he later helped restore a working relationship between Wilhelm and his brother the King. Bismarck was not yet a member of the Landtag, the lower house of the new Prussian legislature. The liberal movement perished by the end of 1848 amid internal fighting. Meanwhile, the conservatives regrouped, formed an inner group of advisers—including the Gerlach brothers, known as the "Camarilla"—around the King, and retook control of Berlin. Although a constitution was granted, its provisions fell far short of the demands of the revolutionaries. 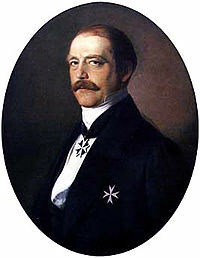 In 1849, Bismarck was elected to the Landtag. At this stage in his career, he opposed the unification of Germany, arguing that Prussia would lose its independence in the process. He accepted his appointment as one of Prussia's representatives at the Erfurt Parliament, an assembly of German states that met to discuss plans for union, but he only did so to oppose that body's proposals more effectively. The parliament failed to bring about unification, for it lacked the support of the two most important German states, Prussia and Austria. In September 1850, after a dispute over Hesse (the Hesse Crisis of 1850), Prussia was humiliated and forced to back down by Austria (supported by Russia) in the so-called Punctation of Olmütz; a plan for the unification of Germany under Prussian leadership, proposed by Prussia's Minister President Radowitz, was also abandoned. In 1851, Frederick William IV appointed Bismarck as Prussia's envoy to the Diet of the German Confederation in Frankfurt. Bismarck gave up his elected seat in the Landtag, but was appointed to the Prussian House of Lords a few years later. In Frankfurt he engaged in a battle of wills with the Austrian representative Count Friedrich von Thun und Hohenstein. He insisted on being treated as an equal by petty tactics such as imitating Thun when Thun claimed the privileges of smoking and removing his jacket in meetings. This episode was the background for an altercation in the Frankfurt chamber with Georg von Vincke that led to a duel between Bismarck and Vincke with Carl von Bodelschwingh as an impartial party, which ended without injury. Bismarck's eight years in Frankfurt were marked by changes in his political opinions, detailed in the numerous lengthy memoranda, which he sent to his ministerial superiors in Berlin. No longer under the influence of his ultraconservative Prussian friends, Bismarck became less reactionary and more pragmatic. He became convinced that to countervail Austria's newly restored influence, Prussia would have to ally herself with other German states. As a result, he grew to be more accepting of the notion of a united German nation. He gradually came to believe that he and his fellow conservatives had to take the lead in creating a unified nation to keep from being eclipsed. He also believed that the middle-class liberals wanted a unified Germany more than they wanted to break the grip of the traditional forces over society. Bismarck also worked to maintain the friendship of Russia and a working relationship with Napoleon III's France, the latter being anathema to his conservative friends, the Gerlachs, but necessary both to threaten Austria and to prevent France allying with Russia. In a famous letter to Leopold von Gerlach, Bismarck wrote that it was foolish to play chess having first put 16 of the 64 squares out of bounds. This observation became ironic, as after 1871, France indeed became Germany's permanent enemy, and eventually allied with Russia against Germany in the 1890s. Bismarck was alarmed by Prussia's isolation during the Crimean War of the mid-1850s, in which Austria sided with Britain and France against Russia; Prussia was almost not invited to the peace talks in Paris. In the Eastern Crisis of the 1870s, fear of a repetition of this turn of events would later be a factor in Bismarck's signing the Dual Alliance with Austria-Hungary in 1879. In October 1857, Frederick William IV suffered a paralysing stroke, and his brother Wilhelm took over the Prussian government as Regent. Wilhelm was initially seen as a moderate ruler, whose friendship with liberal Britain was symbolised by the recent marriage of his son Frederick William to Queen Victoria's eldest daughter. As part of his "New Course", Wilhelm brought in new ministers, moderate conservatives known as the Wochenblatt after their newspaper. The Regent soon replaced Bismarck as envoy in Frankfurt and made him Prussia's ambassador to the Russian Empire. In theory, this was a promotion, as Russia was one of Prussia's two most powerful neighbors. But Bismarck was sidelined from events in Germany and could only watch impotently as France drove Austria out of Lombardy during the Italian War of 1859. Bismarck proposed that Prussia should exploit Austria's weakness to move her frontiers "as far south as Lake Constance" on the Swiss border; instead, Prussia mobilised troops in the Rhineland to deter further French advances into Venetia. Prince Wilhelm became King of Prussia upon his brother Frederick Wilhelm IV's death in 1861. The new monarch often came into conflict with the increasingly liberal Prussian Diet (Landtag). A crisis arose in 1862, when the Diet refused to authorize funding for a proposed re-organization of the army. The King's ministers could not convince legislators to pass the budget, and the King was unwilling to make concessions. Wilhelm threatened to abdicate in favour of his son Crown Prince Frederick William, who opposed his doing so, believing that Bismarck was the only politician capable of handling the crisis. However, Wilhelm was ambivalent about appointing a person who demanded unfettered control over foreign affairs. It was in September 1862, when the Abgeordnetenhaus (House of Deputies) overwhelmingly rejected the proposed budget, that Wilhelm was persuaded to recall Bismarck to Prussia on the advice of Roon. On 23 September 1862, Wilhelm appointed Bismarck Minister President and Foreign Minister. 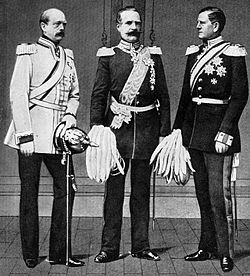 Bismarck, Roon and Moltke took charge at a time when relations among the Great Powers (Great Britain, France, Austria and Russia) had been shattered by the Crimean War and the Italian War. In the midst of this disarray, the European balance of power was restructured with the creation of the German Empire as the dominant power in continental Europe apart from Russia. This was achieved by Bismarck's diplomacy, Roon's reorganization of the army and Moltke's military strategy. Despite the initial distrust of the King and Crown Prince and the loathing of Queen Augusta, Bismarck soon acquired a powerful hold over the King by force of personality and powers of persuasion. Bismarck was intent on maintaining royal supremacy by ending the budget deadlock in the King's favour, even if he had to use extralegal means to do so. Under the Constitution, the budget could be passed only after the king and legislature agreed on its terms. Bismarck contended that since the Constitution did not provide for cases in which legislators failed to approve a budget, there was a "legal loophole" in the Constitution and so he could apply the previous year's budget to keep the government running. Thus, on the basis of the 1861 budget, tax collection continued for four years. Bismarck's conflict with the legislators intensified in the coming years. Following the Alvensleben Convention of 1863, the House of Deputies resolved that it could no longer come to terms with Bismarck; in response, the King dissolved the Diet, accusing it of trying to obtain unconstitutional control over the ministry—which, under the Constitution, was responsible solely to the king. Bismarck then issued an edict restricting the freedom of the press, an edict that even gained the public opposition of the Crown Prince. Despite (or perhaps because of) his attempts to silence critics, Bismarck remained a largely unpopular politician. His supporters fared poorly in the elections of October 1863, in which a liberal coalition, whose primary member was the Progress Party, won over two-thirds of the seats. The House made repeated calls for Bismarck to be dismissed, but the King supported him, fearing that if he did dismiss the Minister President, he would most likely be succeeded by a liberal. German unification had been a major objective of the revolutions of 1848, when representatives of the German states met in Frankfurt and drafted a constitution, creating a federal union with a national parliament to be elected by universal male suffrage. In April 1849, the Frankfurt Parliament offered the title of Emperor to King Frederick William IV. Fearing the opposition of the other German princes and the military intervention of Austria and Russia, the King renounced this popular mandate. Thus, the Frankfurt Parliament ended in failure for the German liberals. Prussia must concentrate and maintain its power for the favorable moment which has already slipped by several times. Prussia's boundaries according to the Vienna treaties are not favorable to a healthy state life. The great questions of the time will not be resolved by speeches and majority decisions – that was the great mistake of 1848 and 1849 – but by iron and blood. Prior to the 1860s, Germany consisted of a multitude of principalities loosely bound together as members of the German Confederation. Bismarck used both diplomacy and the Prussian military to achieve unification, excluding Austria from a unified Germany. This made Prussia the most powerful and dominant component of the new Germany, but also ensured that it remained an authoritarian state and not a liberal parliamentary democracy. Bismarck faced a diplomatic crisis when King Frederick VII of Denmark died in November 1863. The succession to the duchies of Schleswig and Holstein was disputed; they were claimed by Christian IX, Frederick VII's heir as King, and also by Frederick von Augustenburg, a Danish duke. Prussian public opinion strongly favoured Augustenburg's claim, as the populations of Holstein and southern Schleswig were primarily German-speaking. Bismarck took an unpopular step by insisting that the territories legally belonged to the Danish monarch under the London Protocol signed a decade earlier. Nonetheless, Bismarck denounced Christian's decision to completely annex Schleswig to Denmark. With support from Austria, he issued an ultimatum for Christian IX to return Schleswig to its former status. When Denmark refused, Austria and Prussia invaded, sparking the Second Schleswig War. Denmark was ultimately forced to renounce its claim on both duchies. At first this seemed like a victory for Augustenburg, but Bismarck soon removed him from power by making a series of unworkable demands, namely that Prussia should have control over the army and navy of the duchies. Originally, it had been proposed that the Diet of the German Confederation, in which all the states of Germany were represented, should determine the fate of the duchies; but before this scheme could be effected, Bismarck induced Austria to agree to the Gastein Convention. Under this agreement signed on 20 August 1865, Prussia received Schleswig, while Austria received Holstein. In that year Bismarck was given the title of Count (Graf) of Bismarck-Schönhausen. In 1866, Austria reneged on the agreement and demanded that the Diet determine the Schleswig–Holstein issue. Bismarck used this as an excuse to start a war with Austria by accusing them of violating the Gastein Convention. Bismarck sent Prussian troops to occupy Holstein. Provoked, Austria called for the aid of other German states, who quickly became involved in the Austro-Prussian War. Thanks to Roon's reorganization, the Prussian army was nearly equal in numbers to the Austrian army. With the strategic genius of Moltke, the Prussian army fought battles it was able to win. Bismarck had also made a secret alliance with Italy, who desired Austrian-controlled Veneto. Italy's entry into the war forced the Austrians to divide their forces. Meanwhile, as the war began, a German radical named Ferdinand Cohen-Blind attempted to assassinate Bismarck in Berlin, shooting him five times at close range. Bismarck had only minor injuries. Subsequently, Cohen-Blind committed suicide while in custody. Cartoon from 1867 making fun of Bismarck's different roles, from general to minister of foreign affairs, federal chancellor, hunter, diplomat and president of the parliament of the Zollverein, the Prussian-dominated German customs union. The war lasted seven weeks; Germans called it a Blitzkrieg ("lightning war"), a term also used in 1939. Austria had a seemingly powerful army that was allied with most of the north German and all of the south German states. Nevertheless, Prussia won the decisive Battle of Königgrätz. The King and his generals wanted to push onward, conquer Bohemia and march to Vienna, but Bismarck, worried that Prussian military luck might change or that France might intervene on Austria's side, enlisted the help of the Crown Prince, who had opposed the war but had commanded one of the Prussian armies at Königgrätz, to dissuade his father after stormy meetings. Bismarck insisted on a "soft peace" with no annexations and no victory parades, so as to be able to quickly restore friendly relations with Austria. As a result of the Peace of Prague (1866), the German Confederation was dissolved. Prussia annexed Schleswig, Holstein, Frankfurt, Hanover, Hesse-Kassel, and Nassau. Furthermore, Austria had to promise not to intervene in German affairs. To solidify Prussian hegemony, Prussia forced the 21 states north of the River Main to join it in forming the North German Confederation in 1867. The confederation was governed by a constitution largely drafted by Bismarck. Executive power was vested in a president, an hereditary office of the kings of Prussia, who was assisted by a chancellor responsible only to him. As president of the confederation, Wilhelm appointed Bismarck as chancellor of the confederation. Legislation was the responsibility of the Reichstag, a popularly elected body, and the Bundesrat, an advisory body representing the states. The Bundesrat was, in practice, the stronger chamber. Bismarck was the dominant figure in the new arrangement; as Foreign Minister of Prussia, he instructed the Prussian deputies to the Bundesrat. Prussia had only a plurality (17 out of 43 seats) in the Bundesrat despite being larger than the other 21 states combined, but Bismarck could easily control the proceedings through alliances with the smaller states. This began what historians refer to as "The Misery of Austria" in which Austria served as a mere vassal to the superior Germany, a relationship that was to shape history until the end of the First World War. Bismarck had originally managed to convince smaller states like Saxony, Hesse-Kassel, and Hanover to join with Prussia against Austria, after promising them protection from foreign invasion and fair commercial laws. "Politics is the art of the possible." Bismarck, who by now held the rank of major in the Landwehr, wore this uniform during the campaign and was at last promoted to the rank of major-general in the Landwehr cavalry after the war. Although he never personally commanded troops in the field, he usually wore a general's uniform in public for the rest of his life, as seen in numerous paintings and photographs. He was also given a cash grant by the Prussian Landtag, which he used to purchase a country estate in Varzin, now part of Poland. Military success brought Bismarck tremendous political support in Prussia. In the elections of 1866 the liberals suffered a major defeat, losing their majority in the House of Deputies. The new, largely conservative House was on much better terms with Bismarck than previous bodies; at the Minister President's request, it retroactively approved the budgets of the past four years, which had been implemented without parliamentary consent. Bismarck suspected it would split the liberal opposition. While some liberals argued that constitutional government was a bright line that should not be crossed, most of them believed it would be a waste of time to oppose the bill, and supported it in hopes of winning more freedom in the future. The scale of Bismarck's triumph cannot be exaggerated. He alone had brought about a complete transformation of the European international order. He had told those who would listen what he intended to do, how he intended to do it, and he did it. He achieved this incredible feat without commanding an army, and without the ability to give an order to the humblest common soldier, without control of a large party, without public support, indeed, in the face of almost universal hostility, without a majority in parliament, without control of his cabinet, and without a loyal following in the bureaucracy. He no longer had the support of the powerful conservative interest groups who had helped him achieve power. The most senior diplomats in the foreign service ... were sworn enemies and he knew it. The Queen and the Royal Family hated him and the King, emotional and unreliable, would soon have his 70th birthday. ... With perfect justice, in August 1866, he punched his fist on his desk and cried "I have beaten them all! All!" Prussia's victory over Austria increased the already existing tensions with France. The Emperor of France, Napoleon III, had tried to gain territory for France (in Belgium and on the left bank of the Rhine) as a compensation for not joining the war against Prussia and was disappointed by the surprisingly quick outcome of the war. Accordingly, opposition politician Adolphe Thiers claimed that it was France, not Austria, who had really been defeated at Königgrätz. Bismarck, at the same time, did not avoid war with France, though he feared the French for a number of reasons. First, he feared that Austria, hungry for revenge, would ally with the French. Similarly, he feared that the Russian army would assist France to maintain a balance of power. Still, however, Bismarck believed that if the German states perceived France as the aggressor, they would then unite behind the King of Prussia. To achieve this he kept Napoleon III involved in various intrigues, whereby France might gain territory from Luxembourg or Belgium. France never achieved any such gain, but it was made to look greedy and untrustworthy. A suitable pretext for war arose in 1870, when the German Prince Leopold of Hohenzollern-Sigmaringen was offered the Spanish throne, vacant since a revolution in 1868. France pressured Leopold into withdrawing his candidacy. Not content with this, Paris demanded that Wilhelm, as head of the House of Hohenzollern, assure that no Hohenzollern would ever seek the Spanish crown again. To provoke France into declaring war with Prussia, Bismarck published the Ems Dispatch, a carefully edited version of a conversation between King Wilhelm and the French ambassador to Prussia, Count Benedetti. This conversation had been edited so that each nation felt that its ambassador had been slighted and ridiculed, thus inflaming popular sentiment on both sides in favor of war. Langer, however, argues that this episode played a minor role in causing the war. Bismarck wrote in his Memoirs that he "had no doubt that a Franco-German war must take place before the construction of a united Germany could be realised." Yet he felt confident that the French army was not prepared to give battle to Germany's numerically larger forces: " If the French fight us alone they are lost." He was also convinced that the French would not be able to find allies since " France, the victor, would be a danger to everybody – Prussia to nobody." He added, "That is our strong point." France mobilized and declared war on 19 July. The German states saw France as the aggressor, and—swept up by nationalism and patriotic zeal—they rallied to Prussia's side and provided troops. Both of Bismarck's sons served as officers in the Prussian cavalry. The war was a great success for Prussia as the German army, controlled by Chief of Staff Moltke, won victory after victory. The major battles were all fought in one month (7 August to 1 September), and both French armies were captured at Sedan and Metz, the latter after a siege of some weeks. Napoleon III was taken prisoner at Sedan and kept in Germany for a time in case Bismarck had need of him to head the French regime; he later died in exile in England in 1873. The remainder of the war featured a siege of Paris, the city was "ineffectually bombarded"; the new French republican regime then tried, without success, to relieve Paris with various hastily assembled armies and increasingly bitter partisan warfare. Bismarck quoted the first verse lyrics of "La Marseillaise", amongst others, when being recorded on an Edison phonograph in 1889, the only known recording of his voice. A biographer stated that he did so, 19 years after the war, to mock the French. Bismarck acted immediately to secure the unification of Germany. He negotiated with representatives of the southern German states, offering special concessions if they agreed to unification. The negotiations succeeded; patriotic sentiment overwhelmed what opposition remained. While the war was in its final phase, Wilhelm I of Prussia was proclaimed German Emperor on 18 January 1871 in the Hall of Mirrors in the Château de Versailles. The new German Empire was a federation: each of its 25 constituent states (kingdoms, grand duchies, duchies, principalities, and free cities) retained some autonomy. The King of Prussia, as German Emperor, was not sovereign over the entirety of Germany; he was only primus inter pares, or first among equals. However, he held the presidency of the Bundesrat, which met to discuss policy presented by the Chancellor, whom the emperor appointed. In the end, France had to cede Alsace and part of Lorraine, as Moltke and his generals wanted it as a buffer. Historians debate whether Bismarck wanted this annexation or was forced into it by a wave of German public and elite opinion. France was also required to pay an indemnity; the indemnity figure was calculated, on the basis of population, as the precise equivalent of the indemnity that Napoleon I had imposed on Prussia in 1807. Historians debate whether Bismarck had a master plan to expand the North German Confederation of 1866 to include the remaining independent German states into a single entity or simply to expand the power of the Kingdom of Prussia. They conclude that factors in addition to the strength of Bismarck's Realpolitik led a collection of early modern polities to reorganize political, economic, military, and diplomatic relationships in the 19th century. Reaction to Danish and French nationalism provided foci for expressions of German unity. Military successes—especially those of Prussia—in three regional wars generated enthusiasm and pride that politicians could harness to promote unification. This experience echoed the memory of mutual accomplishment in the Napoleonic Wars, particularly in the War of Liberation of 1813–14. By establishing a Germany without Austria, the political and administrative unification in 1871 at least temporarily solved the problem of dualism. In 1871, Bismarck was raised to the rank of Fürst (Prince). He was also appointed as the first Imperial Chancellor (Reichskanzler) of the German Empire, but retained his Prussian offices, including those of Minister-President and Foreign Minister. He was also promoted to the rank of lieutenant-general, and bought a former hotel in Friedrichsruh near Hamburg, which became an estate. He also continued to serve as his own foreign minister. Because of both the imperial and the Prussian offices that he held, Bismarck had near complete control over domestic and foreign policy. The office of Minister President of Prussia was temporarily separated from that of Chancellor in 1873, when Albrecht von Roon was appointed to the former office. But by the end of the year, Roon resigned due to ill health, and Bismarck again became Minister-President. Bismarck launched an anti-Catholic Kulturkampf ("culture struggle") in Prussia in 1871. This was partly motivated by Bismarck's fear that Pius IX and his successors would use papal infallibility to achieve the "papal desire for international political hegemony.... The result was the Kulturkampf, which, with its largely Prussian measures, complemented by similar actions in several other German states, sought to curb the clerical danger by legislation restricting the Catholic church's political power." In May 1872 Bismarck thus attempted to reach an understanding with other European governments to manipulate future papal elections; governments should agree beforehand on unsuitable candidates, and then instruct their national cardinals to vote appropriately. The goal was to end the pope's control over the bishops in a given state, but the project went nowhere. Bismarck accelerated the Kulturkampf. In its course, all Prussian bishops and many priests were imprisoned or exiled. Prussia's population had greatly expanded in the 1860s and was now one-third Catholic. Bismarck believed that the pope and bishops held too much power over the German Catholics and was further concerned about the emergence of the Catholic Centre Party, organised in 1870. With support from the anticlerical National Liberal Party, which had become Bismarck's chief ally in the Reichstag, he abolished the Catholic Department of the Prussian Ministry of Culture. That left the Catholics without a voice in high circles. Moreover, in 1872, the Jesuits were expelled from Germany. In 1873, more anti-Catholic laws allowed the Prussian government to supervise the education of the Roman Catholic clergy and curtailed the disciplinary powers of the Church. In 1875, civil ceremonies were required for civil weddings. Hitherto, weddings in churches were civilly recognized. Kulturkampf became part of Bismarck's foreign-policy, as he sought to destabilize and weaken Catholic regimes, especially in Belgium and France, but he had little success. The British ambassador Odo Russell reported to London in October 1872 that Bismarck's plans were backfiring by strengthening the ultramontane (pro-papal) position inside German Catholicism: "The German Bishops, who were politically powerless in Germany and theologically in opposition to the Pope in Rome, have now become powerful political leaders in Germany and enthusiastic defenders of the now infallible Faith of Rome, united, disciplined, and thirsting for martyrdom, thanks to Bismarck's uncalled for antiliberal declaration of War on the freedom they had hitherto peacefully enjoyed." The Catholics reacted by organizing themselves and strengthening the Centre Party. Bismarck, a devout pietistic Protestant, was alarmed that secularists and socialists were using the Kulturkampf to attack all religion. He abandoned it in 1878 to preserve his remaining political capital since he now needed the Centre Party votes in his new battle against socialism. Pius IX died that year, replaced by the more pragmatic Pope Leo XIII who negotiated away most of the anti-Catholic laws. The Pope kept control of the selection of bishops, and Catholics for the most part supported unification and most of Bismarck's policies. However, they never forgot his culture war and preached solidarity to present organized resistance should it ever be resumed. The anti-Catholic hysteria in many European countries belongs in its European setting. Bismarck's campaign was not unique in itself, but his violent temper, intolerance of opposition, and paranoia that secret forces had conspired to undermine his life's work, made it more relentless. His rage drove him to exaggerate the threat from Catholic activities and to respond with very extreme measures. ... As Odo Russell wrote to his mother, [Lady Emily Russell,] "The demonic is stronger in him than in any man I know." ... The bully, the dictator, and the "demonic" combined in him with the self-pity and the hypochondria to create a constant crisis of authority, which he exploited for his own ends. ... Opponents, friends, and subordinates all remarked on Bismarck as "demonic," a kind of uncanny, diabolic personal power over men and affairs. In these years of his greatest power, he believed that he could do anything. In 1873, Germany and much of Europe and America entered the Long Depression, the Gründerkrise. A downturn hit the German economy for the first time since industrial development began to surge in the 1850s. To aid faltering industries, the Chancellor abandoned free trade and established protectionist import-tariffs, which alienated the National Liberals who demanded free trade. The Kulturkampf and its effects had also stirred up public opinion against the party that supported it, and Bismarck used this opportunity to distance himself from the National Liberals. That marked a rapid decline in the support of the National Liberals, and by 1879 their close ties with Bismarck had all but ended. Bismarck instead returned to conservative factions, including the Centre Party, for support. He helped foster support from the conservatives by enacting several tariffs protecting German agriculture and industry from foreign competitors in 1879. Imperial and provincial government bureaucracies attempted to Germanise the state's national minorities situated near the borders of the empire: the Danes in the North, the Francophones in the West and Poles in the East. As minister president of Prussia and as imperial chancellor, Bismarck "sorted people into their linguistic [and religious] 'tribes'"; he pursued a policy of hostility in particular toward the Poles, which was an expedient rooted in Prussian history. "He never had a Pole among his peasants" working the Bismarckian estates; it was the educated Polish bourgeoisie and revolutionaries he denounced from personal experience, and "because of them he disliked intellectuals in politics." Bismarck's antagonism is revealed in a private letter to his sister in 1861: "Hammer the Poles until they despair of living [...] I have all the sympathy in the world for their situation, but if we want to exist we have no choice but to wipe them out: wolves are only what God made them, but we shoot them all the same when we can get at them." Later that year, the public Bismarck modified his belligerence and wrote to Prussia's foreign minister: "Every success of the Polish national movement is a defeat for Prussia, we cannot carry on the fight against this element according to the rules of civil justice, but only in accordance with the rules of war." With Polish nationalism the ever-present menace, Bismarck preferred expulsion rather than Germanisation. Worried by the growth of the socialist movement, the Social Democratic Party in particular, Bismarck instituted the Anti-Socialist Laws in 1878. Socialist organizations and meetings were forbidden, as was the circulation of socialist literature. Police officers could stop, search and arrest socialist party members and their leaders, a number of whom were then tried by police courts. Despite these efforts, the socialist movement steadily gained supporters and seats in the Reichstag. Socialists won seats in the Reichstag by running as independent candidates, unaffiliated with any party, which was allowed by the German constitution. Bismarck's strategy in the 1880s was to win the workers over for the conservative regime by implementing social benefits. He added accident and old-age insurance as well as a form of socialized medicine. He did not completely succeed, however. Support for the Social Democrats increased with each election. Having unified his nation, Bismarck now devoted himself to promoting peace in Europe with his skills in statesmanship. He was forced to contend with French revanchism, the desire to avenge the losses of the Franco-Prussian War. Bismarck, therefore, engaged in a policy of diplomatically isolating France while maintaining cordial relations with other nations in Europe. He had little interest in naval or colonial entanglements and thus avoided discord with Great Britain. Historians emphasize that he wanted no more territorial gains after 1871, and vigorously worked to form cross-linking alliances that prevented any war in Europe from starting. By 1878 both the Liberal and Conservative spokesmen in Britain hailed him as the champion of peace in Europe. A. J. P. Taylor, a leading British diplomatic historian, concludes that, "Bismarck was an honest broker of peace; and his system of alliances compelled every Power, whatever its will, to follow a peaceful course." Well aware that Europe was skeptical of his powerful new Reich, Bismarck turned his attention to preserving peace in Europe based on a balance of power that would allow Germany's economy to flourish. Bismarck feared that a hostile combination of Austria, France, and Russia would crush Germany. If two of them were allied, then the third would ally with Germany only if Germany conceded excessive demands. The solution was to ally with two of the three. In 1873 he formed the League of the Three Emperors (Dreikaiserbund), an alliance of Wilhelm, Tsar Alexander II of Russia, and Emperor Francis Joseph of Austria-Hungary. Together they would control Eastern Europe, making sure that restive ethnic groups such as the Poles were kept under control. The Balkans posed a more serious issue, and Bismarck's solution was to give Austria predominance in the western areas, and Russia in the eastern areas. This system collapsed in 1887. In 1872, a protracted quarrel began to fester between Bismarck and Count Harry von Arnim, the imperial ambassador to France. Arnim saw himself as a rival and competitor for the chancellorship, but the rivalry escalated out of hand, and Arnim took sensitive records from embassy files at Paris to back up his case. He was formally accused of misappropriating official documents, indicted, tried and convicted, finally fleeing into exile where he died. No one again openly challenged Bismarck in foreign policy matters until his resignation. France was Bismarck's main problem. Peaceful relations with France became impossible after 1871 when Germany annexed all of the province of Alsace and much of Lorraine. Public opinion demanded it to humiliate France, and the Army wanted its more defensible frontiers. Bismarck reluctantly gave in—French would never forget or forgive, he calculated, so might as well take the provinces. (That was a mistaken assumption—after about five years the French did calm down and considered it a minor issue.) Germany's foreign policy fell into a trap with no exit. "In retrospect it is easy to see that the annexation of Alsace-Lorraine was a tragic mistake." Once the annexation took place the only policy that made sense was trying to isolate France so it had no strong allies. However France complicated Berlin's plans when it became friends with Russia. In 1905 a German plan for an alliance with Russia fell through because Russia was too close to France. Between 1873 and 1877, Germany repeatedly manipulated the internal affairs of France's neighbors to hurt France. Bismarck put heavy pressure on Belgium, Spain, and Italy hoping to obtain the election of liberal, anticlerical governments. His plan was to promote republicanism in France by isolating the clerical-monarchist regime of President MacMahon. He hoped that surrounding France with liberal states would help the French republicans defeat MacMahon and his reactionary supporters. The bullying, however, almost got out of hand in mid-1875, when an editorial entitled "Krieg-in-Sicht" ("War in Sight") was published in a Berlin newspaper close to the government, the Post. The editorial indicated that highly influential Germans were alarmed by France's rapid recovery from defeat in 1875 and its announcement of an increase in the size of its army, as well as talks of launching a preventive war against France. Bismarck denied knowing about the article ahead of time, but he certainly knew about the talk of preventive war. The editorial produced a war scare, with Britain and Russia warning that they would not tolerate a preventive war against France. Bismarck had no desire for war either, and the crisis soon blew over. It was a rare instance where Bismarck was outmaneuvered and embarrassed by his opponents, but from that he learned an important lesson. It forced him to take into account the fear and alarm that his bullying and Germany's fast-growing power was causing among its neighbors, and reinforced his determination that Germany should work in proactive fashion to preserve the peace in Europe, rather than passively let events take their own course and reacting to them. Bismarck maintained good relations with Italy, although he had a personal dislike for Italians and their country. He can be seen as a marginal contributor to Italian unification. Politics surrounding the 1866 Austro-Prussian War allowed Italy to annex Venetia, which had been a kronland ("crown land") of the Austrian Empire since the 1815 Congress of Vienna. In addition, French mobilization for the Franco-Prussian War of 1870–1871 made it necessary for Napoleon III to withdraw his troops from Rome and The Papal States. Without these two events, Italian unification would have been a more prolonged process. After Russia's victory over the Ottoman Empire in the Russo-Turkish War of 1877–78, Bismarck helped negotiate a settlement at the Congress of Berlin. The Treaty of Berlin revised the earlier Treaty of San Stefano, reducing the size of newly independent Bulgaria (a pro-Russian state at that time). Bismarck and other European leaders opposed the growth of Russian influence and tried to protect the integrity of the Ottoman Empire (see Eastern Question). As a result, Russo-German relations further deteriorated, with the Russian chancellor Gorchakov denouncing Bismarck for compromising his nation's victory. The relationship was additionally strained due to Germany's protectionist trade policies. Some in the German military clamored for a preemptive war with Russia; Bismarck refused, stating: "Preemptive war is like committing suicide for fear of death." Bismarck realized that both Russia and Britain considered control of central Asia a high priority, dubbed the "Great Game". Germany had no direct stakes, however its dominance of Europe was enhanced when Russian troops were based as far away from Germany as possible. Over two decades, 1871-1890, he maneuvered to help the British, hoping to force the Russians to commit more soldiers to Asia. The League of the Three Emperors having fallen apart, Bismarck negotiated the Dual Alliance with Austria-Hungary, in which each guaranteed the other against Russian attack. He also negotiated the Triple Alliance in 1882 with Austria-Hungary and Italy, and Italy and Austria-Hungary soon reached the "Mediterranean Agreement" with Britain. Attempts to reconcile Germany and Russia did not have a lasting effect: the Three Emperors' League was re-established in 1881 but quickly fell apart, ending Russian-Austrian-Prussian solidarity, which had existed in various forms since 1813. Bismarck therefore negotiated the secret Reinsurance Treaty of 1887 with Russia, in order to prevent Franco-Russian encirclement of Germany. Both powers promised to remain neutral towards one another unless Russia attacked Austria-Hungary. However, after Bismarck's departure from office in 1890, the Treaty was not renewed, thus creating a critical problem for Germany in the event of a war. Bismarck had opposed colonial acquisitions, arguing that the burden of obtaining, maintaining, and defending such possessions would outweigh any potential benefit. He felt that colonies did not pay for themselves, that the German bureaucratic system would not work well in the easy-going tropics, and that the diplomatic disputes colonies brought would distract Germany from its central interest, Europe itself. As for French designs on Morocco, Chlodwig, Prince of Hohenlohe-Schillingsfürst wrote in his memoirs that Bismarck had told him that Germany "could only be pleased if France took possession of the country" since "she would then be very occupied" and distracted from the loss of Alsace-Lorraine. However, in 1883–84 he suddenly reversed himself and overnight built a colonial empire in Africa and the South Pacific. The Berlin Conference of 1884–85 organized by Bismarck can be seen as the formalization of the Scramble for Africa. Historians have debated the exact motive behind Bismarck's sudden and short-lived move. He was aware that public opinion had started to demand colonies for reasons of German prestige. He also wanted to undercut the anti-colonial liberals who were sponsored by the Crown Prince, who—given Wilhelm I's old age—might soon become emperor and remove Bismarck. Bismarck was influenced by Hamburg merchants and traders, his neighbors at Friedrichsruh. 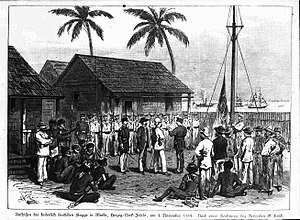 The establishment of the German colonial empire proceeded smoothly, starting with German New Guinea in 1884. Other European nations, led by Britain and France, were acquiring colonies in a rapid fashion (see New Imperialism). Bismarck therefore joined in the Scramble for Africa. Germany's new colonies included Togoland (now Togo and part of Ghana), German Kamerun (now Cameroon and part of Nigeria), German East Africa (now Rwanda, Burundi, and the mainland part of Tanzania), and German South-West Africa (now Namibia). The Berlin Conference (1884–85) established regulations for the acquisition of African colonies; in particular, it protected free trade in certain parts of the Congo basin. Germany also acquired colonies in the Pacific, such as German New Guinea. "Bulgaria, that little country between the Danube and the Balkans, is far from being an object of adequate importance... for which to plunge Europe from Moscow to the Pyrenees, and from the North Sea to Palermo, into a war whose issue no man can foresee. At the end of the conflict we should scarcely know why we had fought." Only a year later , he is faced by the alternative of espousing the cause of Russia or that of Austria. Immediately after the last crisis, in the summer of 1875, the mutual jealousies between Russia and Austria had been rendered acute by the fresh risings in the Balkans against the Turks. Now the issues hung upon Bismarck's decision. Immediately after the peace, he had tried to paralyse the Balkan rivals by the formation of the Three Emperors' League. "I have no thought of intervening," he said privately. "That might precipitate a European war.... If I were to espouse the cause of one of the parties, France would promptly strike a blow on the other side.... I am holding two powerful heraldic beasts by their collars, and am keeping them apart for two reasons: first of all, lest they should tear one another to pieces; and secondly, lest they should come to an understanding at our expense." In the Reichstag, he popularises the same idea in the words: "I am opposed to the notion of any sort of active participation of Germany in these matters, so long as I can see no reason to suppose that German interests are involved, no interests on behalf of which it is worth our risking—excuse my plain speaking—the healthy bones of one of our Pomeranian musketeers." Whatever else may be said of the intricate alliance system evolved by the German Chancellor, it must be admitted that it worked and that it tided Europe over a period of several critical years without a rupture.... there was, as Bismarck himself said, a premium upon the maintenance of peace. His had been a great career, beginning with three wars in eight years and ending with a period of 20 years during which he worked for the peace of Europe, despite countless opportunities to embark on further enterprises with more than even chance of success.... No other statesman of his standing had ever before shown the same great moderation and sound political sense of the possible and desirable.... Bismarck at least deserves full credit for having steered European politics through this dangerous transitional period without serious conflict between the great powers." Franz von Lenbach's portrait of Bismarck in his 75th year. The real grievance of the worker is the insecurity of his existence; he is not sure that he will always have work, he is not sure that he will always be healthy, and he foresees that he will one day be old and unfit to work. If he falls into poverty, even if only through a prolonged illness, he is then completely helpless, left to his own devices, and society does not currently recognize any real obligation towards him beyond the usual help for the poor, even if he has been working all the time ever so faithfully and diligently. The usual help for the poor, however, leaves a lot to be desired, especially in large cities, where it is very much worse than in the country. Bismarck's idea was to implement welfare programs that were acceptable to conservatives without any socialistic aspects. He was dubious about laws protecting workers at the workplace, such as safe working conditions, limitation of work hours, and the regulation of women's and child labor. He believed that such regulation would force workers and employers to reduce work and production and thus harm the economy. Bismarck opened debate on the subject in November 1881 in the Imperial Message to the Reichstag, using the term practical Christianity to describe his program. Bismarck's program centred squarely on insurance programs designed to increase productivity, and focus the political attentions of German workers on supporting the Junkers' government. The program included sickness insurance, accident insurance, disability insurance, and a retirement pension, none of which were then in existence to any great degree. Based on Bismarck's message, the Reichstag filed three bills to deal with the concepts of accident and sickness insurance. The subjects of retirement pensions and disability insurance were placed on the back-burner for the time being. The social legislation implemented by Bismarck in the 1880s played a key role in the sharp, rapid decline of German emigration to America. Young men considering emigration looked at not only the gap between higher hourly "direct wages" in the United States and Germany but also the differential in "indirect wages", social benefits, which favored staying in Germany. The young men went to German industrial cities, so that Bismarck's insurance system partly offset low wage rates in Germany and further reduced the emigration rate. The first successful bill, passed in 1883, was the Sickness Insurance Bill. Bismarck considered the program, established to provide sickness insurance for German industrial laborers, the least important and the least politically troublesome. The health service was established on a local basis, with the cost divided between employers and the employed. The employers contributed one third, and the workers contributed two-thirds. The minimum payments for medical treatment and sick pay for up to 13 weeks were legally fixed. The individual local health bureaus were administered by a committee elected by the members of each bureau, and this move had the unintended effect of establishing a majority representation for the workers on account of their large financial contribution. This worked to the advantage of the Social Democrats who, through heavy worker membership, achieved their first small foothold in public administration. Bismarck's government had to submit three draft bills before it could get one passed by the Reichstag in 1884. Bismarck had originally proposed that the federal government pay a portion of the accident insurance contribution. Bismarck wanted to demonstrate the willingness of the German government to reduce the hardship experienced by the German workers so as to wean them away from supporting the various left-wing parties, most importantly the Social Democrats. The National Liberals took this program to be an expression of State Socialism, against which they were dead set. The Centre Party was afraid of the expansion of federal power at the expense of states' rights. As a result, the only way the program could be passed at all was for the entire expense to be underwritten by the employers. To facilitate this, Bismarck arranged for the administration of this program to be placed in the hands of "Der Arbeitgeberverband in den beruflichen Korporationen" (the Organization of Employers in Occupational Corporations). This organization established central and bureaucratic insurance offices on the federal, and in some cases the state level to actually administer the program whose benefits kicked in to replace the sickness insurance program as of the 14th week. It paid for medical treatment and a pension of up to two-thirds of earned wages if the worker were fully disabled. This program was expanded, in 1886, to include agricultural workers. The old age pension program, insurance equally financed by employers and workers, was designed to provide a pension annuity for workers who reached the age of 70. Unlike the accident and sickness insurance programs, this program covered all categories of workers (industrial, agrarian, artisans and servants) from the start. Also, unlike the other two programs, the principle that the national government should contribute a portion of the underwriting cost, with the other two portions prorated accordingly, was accepted without question. The disability insurance program was intended to be used by those permanently disabled. This time, the state or province supervised the programs directly. The only known recording of Bismarck's voice. See the file's page for a transcript and other details. In 1888 Kaiser Wilhelm I died, leaving the throne to his son, Friedrich III. The new monarch was already suffering from cancer of the larynx and died after reigning for only 99 days. He was succeeded by his son, Wilhelm II, who opposed Bismarck's careful foreign policy, preferring vigorous and rapid expansion to enlarge Germany's "place in the sun". 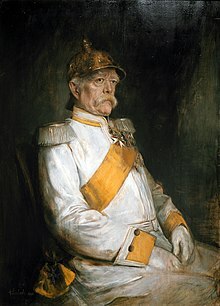 Bismarck was sixteen years older than Friedrich; before the latter became terminally ill, Bismarck did not expect he would live to see Wilhelm ascend to the throne and thus had no strategy to deal with him. Conflicts between Wilhelm and his chancellor soon poisoned their relationship. Their final split occurred after Bismarck tried to implement far-reaching anti-socialist laws in early 1890. The Kartell majority in the Reichstag, including the amalgamated Conservative Party and the National Liberal Party, was willing to make most of the laws permanent. However, it was split about the law granting the police the power to expel socialist agitators from their homes, a power that had been used excessively at times against political opponents. The National Liberals refused to make this law permanent, while the Conservatives supported only the entirety of the bill, threatening to and eventually vetoing the entire bill in session because Bismarck would not agree to a modified bill. As the debate continued, Wilhelm became increasingly interested in social problems, especially the treatment of mine workers during their strike in 1889. Keeping with his active policy in government, he routinely interrupted Bismarck in Council to make clear his social views. Bismarck sharply disagreed with Wilhelm's policies and worked to circumvent them. Even though Wilhelm supported the altered anti-socialist bill, Bismarck pushed for his support to veto the bill in its entirety. When his arguments could not convince Wilhelm, Bismarck became excited and agitated until uncharacteristically blurting out his motive to see the bill fail: to have the socialists agitate until a violent clash occurred that could be used as a pretext to crush them. Wilhelm countered that he was not willing to open his reign with a bloody campaign against his own subjects. The next day, after realizing his blunder, Bismarck attempted to reach a compromise with Wilhelm by agreeing to his social policy towards industrial workers and even suggested a European council to discuss working conditions, presided over by the Emperor. Still, a turn of events eventually led to his breaking with Wilhelm. Bismarck, feeling pressured and unappreciated by the Emperor and undermined by ambitious advisers, refused to sign a proclamation regarding the protection of workers along with Wilhelm, as was required by the German constitution. His refusal to sign was apparently to protest Wilhelm's ever increasing interference with Bismarck's previously unquestioned authority. Bismarck also worked behind the scenes to break the Continental labour council on which Wilhelm had set his heart. The final break came as Bismarck searched for a new parliamentary majority, as his Kartell was voted from power as a consequence of the anti-socialist bill fiasco. The remaining forces in the Reichstag were the Catholic Centre Party and the Conservative Party. Bismarck wished to form a new block with the Centre Party and invited Ludwig Windthorst, the parliamentary leader, to discuss an alliance. That would be Bismarck's last political maneuver. Upon hearing about Windthorst's visit, Wilhelm was furious. In a parliamentary state, the head of government depends on the confidence of the parliamentary majority and has the right to form coalitions to ensure their policies have majority support. However, in Germany, the Chancellor depended on the confidence of the Emperor alone, and Wilhelm believed that the Emperor had the right to be informed before his minister's meeting. 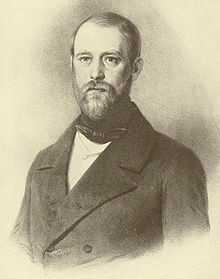 After a heated argument in Bismarck's office, Wilhelm—to whom Bismarck had shown a letter from Tsar Alexander III describing Wilhelm as a "badly brought-up boy"—stormed out, after first ordering the rescinding of the Cabinet Order of 1851, which had forbidden Prussian Cabinet Ministers from reporting directly to the King of Prussia and required them instead to report via the Chancellor. Bismarck, forced for the first time into a situation that he could not use to his advantage, wrote a blistering letter of resignation, decrying Wilhelm's interference in foreign and domestic policy. The letter, however, was published only after Bismarck's death. "Dropping the Pilot" – A caricature by John Tenniel, published in the English magazine Punch, 29 March 1890. Thus ended the extraordinary public career of Otto von Bismarck, who ... had presided over the affairs of a state he made great and glorious. ... Now the humble posture that he had necessarily adopted in his written communications with his royal master had become his real posture. The old servant, no matter how great and how brilliant, had become in reality what he had always played as on a stage: a servant who could be dismissed at will by his Sovereign. He had defended that royal prerogative because it had allowed him to carry out his immense will; now the absolute prerogative of the Emperor became what it has always been, the prerogative of the sovereign. Having crushed his parliamentary opponents, flattened and abused his ministers, and refused to allow himself to be bound by any loyalty, Bismarck had no ally left when he needed it. It was not his cabinet nor his parliamentary majority. He had made sure that it remained the sovereign's, and so it was that he fell because of a system that he preserved and bequeathed to the unstable young Emperor. Bismarck was succeeded as Imperial Chancellor and Minister President of Prussia by Leo von Caprivi. After his dismissal he was promoted to the rank of "Colonel-General with the Dignity of Field Marshal", so-called because the German Army did not appoint full Field Marshals in peacetime. He was also given a new title, Duke of Lauenburg, which he joked would be useful when traveling incognito. He was soon elected to the Reichstag as a National Liberal in Bennigsen's old and supposedly safe Hamburg seat, but he was so humiliated by being taken to a second ballot by a Social Democrat opponent that he never actually took up his seat. 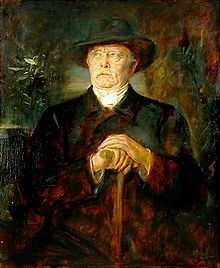 Bismarck entered into resentful retirement, lived in Friedrichsruh near Hamburg and sometimes on his estates at Varzin, and waited in vain to be called upon for advice and counsel. After his wife's death on 27 November 1894, his health worsened and one year later he was finally confined to a wheelchair. Your Majesty, so long as you have this present officer corps, you can do as you please. But when this is no longer the case, it will be very different for you. Jena came twenty years after the death of Frederick the Great; the crash will come twenty years after my departure if things go on like this. One day the great European War will come out of some damned foolish thing in the Balkans. Bismarck spent his final years composing his memoirs (Gedanken und Erinnerungen, or Thoughts and Memories), a work lauded by historians. In the memoirs Bismarck continued his feud with Wilhelm II by attacking him here, and by increasing the drama around every event and by often presenting himself in a favorable light. He also published the text of the Reinsurance Treaty with Russia, a major breach of national security, for which an individual of lesser status would have been heavily prosecuted. Bismarck's health began to fail in 1896. He was diagnosed with gangrene in his foot, but refused to accept treatment for it; as a result he had difficulty walking and was often confined to a wheelchair. By July 1898 he was permanently wheelchair-bound, had trouble breathing, and was almost constantly feverish and in pain. His health rallied momentarily on the 28th, but then sharply deteriorated over the next two days. He died just after midnight on 30 July 1898, at the age of eighty-three in Friedrichsruh, where he is entombed in the Bismarck Mausoleum. He was succeeded as Prince Bismarck by his eldest son, Herbert. Bismarck managed a posthumous snub of Wilhelm II by having his own sarcophagus inscribed with the words, "A loyal German servant of Emperor Wilhelm I". Historians have reached a broad consensus on the content, function and importance of the image of Bismarck within Germany's political culture over the past 125 years. According to Steinberg, his achievements in 1862–71 were "the greatest diplomatic and political achievement by any leader in the last two centuries." Bismarck's most important legacy is the unification of Germany. Germany had existed as a collection of hundreds of separate principalities and Free Cities since the formation of the Holy Roman Empire. Over the centuries various rulers had tried to unify the German states without success until Bismarck. Largely as a result of Bismarck's efforts, the various German kingdoms were united into a single country. Following unification, Germany became one of the most powerful nations in Europe. Bismarck's astute, cautious, and pragmatic foreign policies allowed Germany to peacefully retain the powerful position into which he had brought it, while maintaining amiable diplomacy with almost all European nations. France was the main exception because of the Franco–Prussian War and Bismarck's harsh subsequent policies; France became one of Germany's most bitter enemies in Europe. Austria, too, was weakened by the creation of a German Empire, though to a much lesser extent than France. Bismarck believed that as long as Britain, Russia and Italy were assured of the peaceful nature of the German Empire, French belligerency could be contained; his diplomatic feats were undone, however, by Kaiser Wilhelm II, whose policies unified other European powers against Germany in time for World War I. Historians stress that Bismarck's peace-oriented, "saturated continental diplomacy" was increasingly unpopular, because it consciously reined in any expansionist drives. In dramatic contrast stands the ambition of Wilhelm II's Weltpolitik to secure the Reich's future through expansion, leading to World War I. Likewise Bismarck's policy to deny the military a dominant voice in foreign political decision making was overturned by 1914 as Germany became an armed state. [Bismarck's friend, German diplomat Kurd von Schlözer] began to see Bismarck as a kind of malign genius who, behind the various postures, concealed an ice-cold contempt for his fellow human beings and a methodical determination to control and ruin them. His easy chat combined blunt truths, partial revelations, and outright deceptions. His extraordinary double ability to see how groups would react and the willingness to use violence to make them obey, the capacity to read group behavior and the force to make them move to his will, gave him the chance to exercise what [Steinberg has] called his "sovereign self"
Evans says he was "intimidating and unscrupulous, playing to others' frailties, not their strengths." British historians, including Steinberg, Evans, Taylor, Palmer and Crankshaw, see Bismarck as an ambivalent figure, undoubtedly a man of great skill but who left no lasting system in place to guide successors less skilled than himself. Being a committed monarchist himself, Bismarck allowed no effective constitutional check on the power of the Emperor, thus placing a time bomb in the foundation of the Germany that he created. Observers at the time and since have commented on Bismarck's skill as a writer. As Henry Kissinger has noted, "The man of 'blood and iron' wrote prose of extraordinary directness and lucidity, comparable in distinctiveness to Churchill's use of the English language." a political genius of a very unusual kind [whose success] rested on several sets of conflicting characteristics among which brutal, disarming honesty mingled with the wiles and deceits of a confidence man. He played his parts with perfect self-confidence, yet mixed them with rage, anxiety, illness, hypochrondria, and irrationality. ... He used democracy when it suited him, negotiated with revolutionaries and the dangerous Ferdinand Lassalle, the socialist who might have contested his authority. He utterly dominated his cabinet ministers with a sovereign contempt and blackened their reputations as soon as he no longer needed them. He outwitted the parliamentary parties, even the strongest of them, and betrayed all those ... who had put him into power. By 1870 even his closest friends ... realized that they had helped put a demonic figure into power. During most of his nearly thirty-year-long tenure, Bismarck held undisputed control over the government's policies. He was well supported by his friend Albrecht von Roon, the war minister, as well as the leader of the Prussian army Helmuth von Moltke. Bismarck's diplomatic moves relied on a victorious Prussian military, and these two men gave Bismarck the victories he needed to convince the smaller German states to join Prussia. Bismarck took steps to silence or restrain political opposition, as evidenced by laws restricting the freedom of the press, and the anti-socialist laws. He waged a culture war (Kulturkampf) against the Catholic Church until he realized the conservatism of the Catholics made them natural allies against the Socialists. His king Wilhelm I rarely challenged the Chancellor's decisions; on several occasions, Bismarck obtained his monarch's approval by threatening to resign. However, Wilhelm II intended to govern the country himself, making the ousting of Bismarck one of his first tasks as Kaiser. Bismarck's successors as Chancellor were much less influential, as power was concentrated in the Emperor's hands. 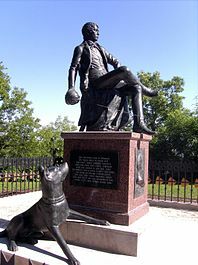 Immediately after he left office, citizens started to praise him and established funds to build monuments like the Bismarck Memorial or towers dedicated to him. Throughout Germany, the accolades were unending, several buildings were named in his honour, portraits of him were commissioned from artists such as Franz von Lenbach and C.W. Allers and books about him became best-sellers. The first monument built in his honour was the one at Bad Kissingen erected in 1877. Numerous statues and memorials dot the cities, towns, and countryside of Germany, including the famous Bismarck Memorial in Berlin and numerous Bismarck towers on four continents. The only memorial depicting him as a student at Göttingen University (together with a dog, possibly his Reichshund Tyras) and as a member of his Corps Hannovera was re-erected in 2006 at the Rudelsburg. 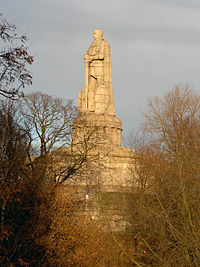 The gleaming white 1906 Bismarck Monument in the city of Hamburg, stands in the centre of the St. Pauli district, and is the largest, and probably best-known, memorial to Bismarck worldwide. The statues depicted him as massive, monolithic, rigid and unambiguous. Two warships were named in his honour, the SMS Bismarck of the German Imperial Navy, and the Bismarck from the World War II–era. 1915 WWI Judaica Silver Medal by Hugo Grünthal and Paul Sturm for Bismarck's 100th Birthday, obverse. 1915 the reverse of this medal is symbolising the war efforts by a giant carrying Germany. Bismarck was the most memorable figure in Germany down to the 1930s. The dominant memory was the great hero of the 1860s, who defeated all enemies, especially France, and unified Germany to become the most powerful military and diplomatic force in the world. 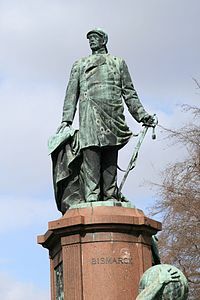 Of course, there were no monuments celebrating Bismarck's devotion to the cause of European peace after 1871. But there were other German memories. His fellow Junkers were disappointed, as Prussia after 1871 became swallowed up and dominated by the German Empire. Liberal intellectuals, few in number but dominant in the universities and business houses, celebrated his achievement of the national state, a constitutional monarchy, and the rule of law, and forestalling revolution and marginalizing radicalism. Social Democrats and labor leaders had always been his target, and he remained their bête noire. Catholics could not forget the Kulturkampf and remained distrustful. Especially negative were the Poles who hated his Germanization programs. Robert Gerwarth shows that the Bismarck myth, built up predominantly during his years of retirement and even more stridently after his death, proved a powerful rhetorical and ideological tool. The myth made him out to be a dogmatic ideologue and ardent nationalist when, in fact, he was ideologically flexible. Gerwarth argues that the constructed memory of Bismarck played a central role as an antidemocratic myth in the highly ideological battle over the past, which raged between 1918 and 1933. This myth proved to be a weapon against the Weimar Republic and exercised a destructive influence on the political culture of the first German democracy. Frankel in Bismarck's Shadow (2005) shows the Bismarck cult fostered and legitimized a new style of right-wing politics. It made possible the post-Bismarckian crisis of leadership, both real and perceived, that had Germans seeking the strongest possible leader and asking, "What Would Bismarck Do?" For example, Hamburg's memorial, unveiled in 1906, is considered one of the greatest expressions of Imperial Germany's Bismarck cult and an important development in the history of German memorial art. It was a product of the desire of Hamburg's patrician classes to defend their political privileges in the face of dramatic social change and attendant demands for political reform. To those who presided over its construction, the monument was also a means of asserting Hamburg's cultural aspirations and of shrugging off a reputation as a city hostile to the arts. The memorial was greeted with widespread disapproval among the working classes and did not prevent their increasing support for the Social Democrats. Bismarck Archipelago, near the former German colony of New Guinea. Bismarck, North Dakota, a city and state capital in the United States. Bismarck, Missouri, a city in Missouri. Bismarck Strait, a channel in Antarctica. Bismarck was created Graf von Bismarck-Schönhausen ("Count of Bismarck-Schönhausen") in 1865; this comital title is borne by all his descendants in the male line. In 1871, he was further created Fürst von Bismarck ("Prince of Bismarck") and accorded the style of Durchlaucht ("Serene Highness"); this princely title descended only to his eldest male heirs. In 1890, Bismarck was granted the title of Herzog von Lauenburg ("Duke of Lauenburg"); the duchy was one of the territories that Prussia seized from the king of Denmark in 1864. It was Bismarck's ambition to be assimilated into the mediatized houses of Germany. He attempted to persuade Kaiser Wilhelm I that he should be endowed with the sovereign duchy of Lauenburg, in reward for his services to the imperial family and the German empire. This was on the understanding that Bismarck would immediately restore the duchy to Prussia; all he wanted was the status and privileges of a mediatized family for himself and his descendants. This novel idea was rejected by the conservative emperor, who thought that he had already given the chancellor enough rewards. There is reason to believe that he informed Wilhelm II of his wishes. After being forced by the sovereign to resign, he received the purely honorific title of "Duke of Lauenburg", without the duchy itself and the sovereignty that would have transformed his family into a mediatized house. Bismarck regarded it as a mockery of his ambition, and he considered nothing more cruel than this action of the emperor. Upon Bismarck's death in 1898 his dukedom, held only for his own lifetime, became extinct. Historian Robert K. Massie has noted Bismarck's popular image was as "gruff" and "militaristic", while in reality "Bismarck's tool was aggressive, ruthless diplomacy." Bismarck is one of the principal characters in Royal Flash, the second novel in the Flashman series written by George MacDonald Fraser. Bismarck, portrayed by Curd Jürgens, appears as a major character in the 1974 British television series Fall of Eagles. In the 2014 Danish series 1864, Bismarck is portrayed by Rainer Bock. Bismarck appears as the leader of the German civilization in the computer strategy games, Civilization III, Civilization IV and Civilization V.
^ a b Steinberg, Jonathan (1 June 2011). Bismarck: A Life. p. 51. ISBN 9780199782529. ^ Pflanze 1990, p. 68. ^ Eric Hobsbawm, The Age of Empire: 1875–1914 (1987), p. 312. ^ Hopel, Thomas (23 August 2012) "The French-German Borderlands: Borderlands and Nation-Building in the 19th and 20th Centuries"
^ Steinberg, 2011, pp. 8, 424, 444; Bismarck specifically referred to Socialists, among others, as "Enemies of the Reich". ^ Hull, Isabel V. (2004). The Entourage of Kaiser Wilhelm II, 1888–1918. p. 85. ISBN 9780521533218. ^ Lowe, Charles (2005). Prince Bismarck: An Historical Biography With Two Portraits. Kessinger Publishing. p. 538. ISBN 9781419180033. ^ Field 1898, pp. 603–04. ^ Steinberg, 2011, pp. 39–41. ^ Steinberg, 2011, p. 93. ^ Pflanze 1971, p. 56. ^ Steinberg, 2011, p. 89. ^ Steinberg, 2011, p. 86. ^ Steinberg, 2011, pp. 87–88. ^ Pflanze 1971, p. 64. ^ Alan Palmer, Bismarck [Charles Scribner Publishers: New York, 1976] p. 41. ^ Alan Palmer, Bismarck, p. 42. ^ Steinberg, 2011, p. 117. ^ Steinberg, 2011, pp. 142–43. ^ Quotations from letters between Leopold von Gerlach and Bismarck debating the topic of Napoleon III are in Steinberg, 2011, pp. 131–33. ^ Steinberg, 2011, ch. 5. ^ Steinberg, 2011, ch. 6. ^ Eyck 1964, pp. 58–68. ^ Taylor 1969, pp. 48–51. ^ Eyck 1964, pp. 69–70. ^ Hollyday 1970, pp. 16–18. ^ Gordon A. Craig, Germany, 1866–1945 (1978), pp. 1–21. ^ Eyck 1964, pp. 58–106. ^ Eyck 1964, pp. 107–38. ^ Darmstaedter, Friedrich (2008). Bismarck and the Creation of the Second Reich. Transaction Publishers. p. 289. ISBN 9781412807838. ^ Steinberg, 2011, p. 253. ^ Steinberg, 2011, p. 257. ^ Howard 1991, p. 40. ^ Bismarck, Otto von (1966). The Memoirs vol. II. New York, NY: Howard Fertig. pp. 58–60. ^ Eyck 1964, pp. 139–86. ^ William Langer, "Bismarck as Dramatist," in Studies in Diplomatic History & Historiography in Honour of G.P. Gooch (1962) pp. 199–216. ^ Bismarck, Otto, The Man & the Statesman, Vol. 2, Cosimo Classics, 2013, 384 p. ISBN 978-1596051850, p. 58. ^ Poschinger, Heinrich, Conversations with Prince Bismarck, Kessinger Publishing, 2007, 304 p. ISBN 0548341362, p. 87. ^ Taylor 1969, p. 126. ^ Cowen, Rob (31 January 2012). "Restored Edison Records Revive Giants of 19th-Century Germany". The New York Times. p. D3. ^ Crankshaw 1981, pp. 294–96. ^ Stern, Fritz (2013). Gold and Iron. p. 139. ISBN 9780307829863. ^ Taylor 1969, p. 133. ^ Steinberg, 2011, pp. 311–12. ^ Hollyday 1970, p. 6. ^ Blackbourn 1998, pp. 261–63. ^ Stone, James (1994). "Bismarck and the Containment of France, 1873–1877". Canadian Journal of History. 29 (2): 281–304. Archived from the original on 14 December 2014. ^ Steinberg, 2011, pp. 335–36. ^ E. J. Feuchtwanger, Bismarck (2002) p. 208. ^ Taylor 1969, p. 124. ^ Taylor 1969, p. 10. ^ a b Crankshaw 1981, p. 149. ^ Crankshaw 1981, p. 404. ^ Shirley, Michael H.; Larson, Todd E. A., eds. (2016). Splendidly Victorian: Essays in Nineteenth- and Twentieth-Century British History in Honour of Walter L. Arnstein. Routledge. p. 146ff. ISBN 9781317243274. ^ A.J.P. Taylor, Europe: Grandeur and Decline (1967) p. 89. ^ Raymond James Sontag, European Diplomatic History: 1871–1932 (1933) pp. 3–58. ^ W. N. Medlicott, "Bismarck and the Three Emperors' Alliance, 1881-87," Transactions of the Royal Historical Society Vol. 27 (1945), pp. 61-83 online. ^ Crankshaw 1981, p. 322. ^ Mitchell, Allan (2018). The German Influence in France after 1870: The Formation of the French Republic. p. 190. ISBN 9781469622927. ^ Kent, George O. (1978). Bismarck and His Times. Southern Illinois UP. p. 79. ISBN 9780809308590. ^ See also Ullrich, Volker (2015). Bismarck. p. 57. ISBN 9781910376249. and Clark, Christopher M. (2006). Iron Kingdom: The Rise and Downfall of Prussia, 1600-1947. p. 553. ISBN 9780674023857. ^ John Keiger, France and the World since 1870 (2001) pp 111-117. ^ Lothar Gall, Bismarck: The White Revolutionary, Volume 2: 1871–1898 (1986) pp. 46–48. ^ William L. Langer, European Alliances and Alignments, 1871–1890 (2nd ed. 1950) pp. 44–55. ^ Taylor 1969, p. 212. ^ Retallack 2008, p. 29. ^ James Stone, "Bismarck and the Great Game: Germany and Anglo-Russian Rivalry in Central Asia, 1871–1890." Central European History 48.2 (2015): 151-175. ^ a b Hartmut Pogge von Strandmann. "Domestic Origins of Germany's Colonial Expansion under Bismarck." Past & Present (Feb 1969), Issue 42, pp. 140–59 in JSTOR. ^ Chlodwig of Hohenlohe-Schillingsfuerst, Memoirs, W. Heinemann, 1906, p. 259. ^ Kennedy 1988, ch 10. ^ Eyck 1964, pp. 273–76. ^ Wehler 1970, pp. 119–55. ^ Crankshaw 1981, pp. 395–97. ^ Firth, S. G. (1972). "The New Guinea Company, 1885–1899: A case of unprofitable imperialism". Historical Studies. 15 (59): 361–77. doi:10.1080/10314617208595478. ^ Ludwig 1927a, p. 73. ^ Ludwig 1927b, p. 511. ^ William L. Langer, European Alliances and Alignments: 1871–1890 (2nd ed.) 1950 p. 459. ^ Langer, European Alliances and Alignments: 1871–1890 pp. 503–04. ^ E. P. Hennock. "Social Policy under the Empire: Myths and Evidence" German History 1998 16(1): 58–74; Herman Beck, The Origins of the Authoritarian Welfare State in Prussia. Conservatives, Bureaucracy, and the Social Question, 1815–70. 1995. ^ Frederic B. M. Hollyday, Bismarck (1970) p. 65. ^ Moritz Busch. Bismarck: Some secret pages from his history. New York: Macmillan, 1898. Vol. II, p. 282. ^ a b c Holborn, Hajo. A History of Modern Germany – 1840–1945. Princeton UP, 1969. pp. 291–93. ^ Khoudour-Castéras, David (2008). "Welfare State and Labor Mobility: The Impact of Bismarck's Social Legislation on German Emigration Before World War I". Journal of Economic History. 68 (1): 211–43. doi:10.1017/s0022050708000077. ^ Leichter, Howard M. (1979). A comparative approach to policy analysis: health care policy in four nations. Cambridge: Cambridge University Press. p. 121. ISBN 978-0-521-22648-6. The Sickness Insurance Law (1883). Eligibility. The Sickness Insurance Law came into effect in December 1884. It provided for compulsory participation by all industrial wage earners (i.e., manual laborers) in factories, ironworks, mines, shipbuilding yards, and similar workplaces. ^ Hennock, Ernest Peter (2007). The origin of the welfare state in England and Germany, 1850–1914: social policies compared. Cambridge: Cambridge University Press. p. 157. ISBN 978-0-521-59212-3. ^ E. P. Hennock, "Social Policy in the Bismarck Era: A Progress Report," German History, (June 2003) 21#2 pp. 229–38 online. ^ Craig, (1978) pp. 225–29. ^ Steinberg, 2011, pp. 429–64. ^ Craig, (1978) pp. 171–79. ^ Eyck (1958), p. 321. ^ Steinberg, 2011, p. 449. ^ Steinberg, pp. 446, 459, 463. ^ Lerman, Katharine (2014). Bismarck. Routledge. p. 257. ISBN 9781317900627. ^ Palmer, Alan (1976). Bismarck. New York City: Charles Scribner's Sons. p. 267. ISBN 978-0684146836. ^ Taylor 1969, p. 264. ^ Bingham, Colin (1982). Wit and Wisdom: A Public Affairs Miscellany. p. 118. ISBN 9780522842418. ^ Egerton, George W. (1994). Political Memoir: Essays on the Politics of Memory. Psychology Press. p. 14. ISBN 9780714634715. ^ Steinberg, 2011, p. 184. ^ Steinberg, 2011, p. 466. ^ Evans, Richard J. (23 February 2012) "The Gambler in Blood and Iron," New York Review of Books p. 39. ^ Sieglinde Seele, Lexikon der Bismarck-Denkmäler. Türme, Standbilder, Büsten, Gedenksteine und andere Ehrungen, Michael Imhof Verlag: Petersberg, 2005; 480 pp. ^ Taylor, A. J. P. (1955) Bismarck, the Man and the Statesman New York: Knopf. pp. 241–44, 267–69. ^ Russell, Mark A. Russell (2000) "The Building of Hamburg's Bismarck Memorial, 1898–1906." Historical Journal 43#1 (2000): 133–56. Chisholm, Hugh, ed. (1911). "Bismarck Archipelago" . Encyclopædia Britannica. 4 (11th ed.). Cambridge University Press. ^ Stapp, Katherine; W. I. Bowman (1968). History Under Our Feet: The Story of Vermilion County, Illinois. Danville, Illinois: Interstate Printers and Publishers, Inc. pp. 50–51. ^ "Bismarck City Portrait". City of Bismarck. Archived from the original on 19 September 2010. Retrieved 19 September 2010. ^ Forsythe, Roger (29 June 1993). "FIRST CAME THE TRAINS (A History of Bismarck)". Daily Journal. Retrieved 11 March 2019. ^ "Bismarck Strait, Antarctica". geographic.org. Retrieved 11 March 2019. ^ "A Veteran Diplomat" (27 September 1908). "The "Mediatized" – or the "High Nobility" of Europe; Consisting of Something Like Fifty families Which Enjoyed Petty Sovereignty Before the Holy Roman Empire's Overthrow, They Still Exercise Certain Special Privileges Mixed with Unusual Restrictions". The New York Times. ^ von Arndt, Ludwig; Müller-Wusterwitz, Nikolaj; von Bismarck, Ferdinand (15 May 2008). Die Orden und Ehrenzeichen des Reichskanzlers Fürst Otto von Bismarck (in German). Phaleristischer Verlag. ^ Müller, Wilhelm (2013). Politische Geschichte der Gegenwart: 18. Das Jahr 1884. Heidelberg: Springer Verlag. p. 93. ISBN 9783642991806. ^ Orden Pour le Mérite für Wissenschaften und Künste (1978). Die Mitglieder des Ordens. 2 1882–1952 (PDF). Berlin: Gebr. Mann Verlag. p. 116. ISBN 978-3-7861-1125-2. ^ "Grand Crosses of the Order of the Tower and Sword". geneall.net. Retrieved 2018-08-10. ^ "Toison Espagnole (Spanish Fleece) - 19th century" (in French), Chevaliers de la Toison D'or. Retrieved 2018-08-10. ^ Burt, Daniel S. (2001). The Biography Book: A Reader's Guide to Nonfiction, Fictional, and Film Biographies of More Than 500 of the Most Fascinating Individuals of All Time. Greenwood. p. 33. ISBN 9781573562560. ^ Giddings, Robert; Selby, K. (2001). The Classic Serial on Television and Radio. Palgrave Macmillan UK. pp. 213–. ISBN 9780230596290. ^ "1864 (TV Mini-Series 2014)". IMDb. Retrieved 22 June 2018. ^ Dobrin, Sidney I. (2009). Ecosee: Image, Rhetoric, Nature. SUNY Press. p. 272. ISBN 9781438425849. Crankshaw, Edward (1981). Bismarck. The Viking Press. ISBN 978-0670169825. Darmstaedter, Friedrich (2008). Bismarck and the Creation of the Second Reich. Russel & Russel. ISBN 978-0846206248. Dawson, William Harbutt (1908). The Evolution of Modern Germany. CreateSpace Independent Publishing Platform. ISBN 978-1519547781. Engelberg, Ernst (1986–90). Bismarck (in German). 1–2. Fayard. ISBN 978-3827500243. Eyck, Erich (1964). Bismarck and the German Empire. W. W. Norton & Company; 1st edition. ISBN 978-0393002355. Feuchtwanger, Edgar (2002). Bismarck. Historical Biographies. Routledge. ISBN 978-0415216135. Gall, Lothar (1990). Bismarck: The White Revolutionary. 1. Unwin Hyman. ISBN 978-0044457787. Gall, Lothar (1990). Bismarck: The White Revolutionary. 2. Trans. J. A. Underwood. Unwin Hyman. ISBN 978-0044457794. Headlam, James Wycliffe (1899). Bismarck and the Foundation of the German Empire. IndyPublish. ISBN 978-1414232713. Hollyday, F. B. M. (1970). Bismarck. Great Lives Observed. Prentice-Hall. ISBN 978-0130773623. Kent, George O. (1978). Bismarck and His Times. Southern Illinois University Press. ISBN 978-0809308590. Lerman, Katharine Anne. (2004). Bismarck: Profiles in Power. Longman. ISBN 978-0-582-03740-3. Ludwig, Emil (1927). Wilhelm Hohenzollern: The last of the Kaisers. Trans. Ethel Colburn Mayne. New York: Kessinger Publishing, LLC. ISBN 9780766143418. Ludwig, Emil (1927). Bismarck: The Story of a Fighter. Skyhorse Publishing. ISBN 978-1620871768. Pflanze, Otto (1971). Bismarck and the Development of Germany: The Period of Unification, 1815–1871. 1. Princeton University Press. ISBN 978-0691007656. Pflanze, Otto (1990) . Bismarck and the Development of Germany: The Period of Consolidation, 1871–1880. 2. Princeton University Press. ISBN 0-691-05588-2. Pflanze, Otto (April 1955). "Bismarck and German Nationalism". American Historical Review. 60 (3): 548–66. doi:10.2307/1845577. JSTOR 1845577. Steinberg, Jonathan (2011). Bismarck: A Life. Oxford University Press. ISBN 978-0199975396. Kissinger, Henry A (31 March 2011). "Otto von Bismarck, Master Statesman". The New York Times (book review). Stern, Fritz (1977). Gold and Iron: Bismarck, Bleichröder and the Building of the German Empire. Vintage. ISBN 978-0394740348. Taylor, A.J.P. (1969) . Bismarck: the Man and the Statesman. New York: Alfred A Knopf. ISBN 978-0394703879. Berghahn, Volker (1994). Imperial Germany, 1871–1914: Economy, Society, Culture and Politics. Berghahn Books. ISBN 978-1845450113. Blackbourn, David (1998). History of Germany, 1780–1918: The Long Nineteenth Century (Revised second ed.). Blackwell. ISBN 978-0631231967. Clark, Christopher (2009). Iron Kingdom: The Rise and Downfall of Prussia, 1600–1947. Belknap Press: An Imprint of Harvard University Press. ISBN 978-0674031968. Craig, Gordon A. (1978). Germany, 1866–1945. Oxford University Press. ISBN 978-0195027242. Holborn, Hajo (1982). "The Constitutional Conflict in Prussia and the Early Years of the Bismarck Ministry". The History of Modern Germany 1840–1945. 3. Princeton University Press. pp. 131–72. ISBN 978-0691007977. Holborn, Hajo (1982). "The Founding of the New German Empire, 1865–71". The History of Modern Germany 1840–1945. Princeton University Press. pp. 173–229. ISBN 978-0691007977. Holborn, Hajo (1969). "Bismarck and the Consolidation of the German Empire, 1871–90". The History of Modern Germany 1840–1945. Princeton University Press. pp. 233–97. ISBN 978-0691007977. Langer, William L. (1931). European Alliances and Alignments, 1871–1890. ASIN B001GJV44A. Highly detailed diplomatic history of all major European powers. Retallack, James N. (2008). Imperial Germany, 1871–1918. Oxford University Press. ISBN 978-0199204878. Robinson, Janet; Robinson, Joe (2009). Handbook of Imperial Germany. AuthorHouse. ISBN 978-1449021139. Sheehan, James J. (1989). German History, 1770–1866 (Reprint ed.). Clarendon Press. ISBN 978-0198204329. Sheehan, James J. (1978). German liberalism in the ninetury century. University of Chicago Press; ACLS. hdl:2027/heb.01317.0001.001. Beck, Hermann (1995). Origins of the Authoritarian Welfare State in Prussia, 1815–1870. The University of Michigan Press. ISBN 978-0-472-08428-9. Brandenburg, Erich (1933). From Bismarck to the World War: A History of German Foreign Policy 1870–1914 (Reprint ed.). Howard Fertig Publisher. ISBN 978-0865274228. Archived from the original on 15 March 2017. Carroll, E. Malcolm (1975). Germany and the great powers, 1866–1914: A Study in Public Opinion and Foreign Policy. Octagon Books. ISBN 978-0374912994. Clark, Chester Wells (1934). Franz Joseph and Bismarck: The Diplomacy of Austria before the War of 1866. Cambridge, Massachusetts: Harvard University Press. ASIN B0006BUIOG. Field, W. G. (October 1898). "Bismarck's First School". The Journal of Education. 20: 603–04. Goddard, Stacie E. (2008). "When Right Makes Might: How Prussia Overturned the European Balance of Power". International Security. 33 (3 Winter): 110–42. JSTOR 40207143. Gross, Michael B. (2005). The War against Catholicism: Liberalism and the Anti-Catholic Imagination in Nineteenth-Century Germany (New ed.). University of Michigan Press. ISBN 978-0472031306. Hennock, E. P. (2007). The Origin of the Welfare State in England and Germany, 1850–1914: Social Policies Compared. Cambridge: Cambridge University Press. ISBN 978-0521597708. Hennock, E. P. (2003). "Social Policy in the Bismarck Era: A Progress Report". German History. 21 (2): 229–38. Howard, Michael (1991) . The Franco-Prussian War: The German invasion of France, 1870–1871 (2nd ed.). Routledge. ISBN 978-0415266710. Kennedy, Paul M. (1988). The Rise of the Anglo-German Antagonism, 1860–1914. Humanity Books. ISBN 157392301X. Kissinger, Henry (1968). "The White Revolutionary: Reflections on Bismarck". Daedalus. 97 (3): 888–924. JSTOR 20023844. Lord, Robert H. (1923). "Bismarck and Russia in 1863". American Historical Review. 29 (1): 2–48. JSTOR 1839273. Medlicott, W. N. (1945). "Bismarck and the Three Emperors' Alliance, 1881-87". Transactions of the Royal Historical Society. 27: 61–83. JSTOR 3678575. Mork, Gordon R. (1971). "Bismarck and the 'Capitulation' of German Liberalism". Journal of Modern History. 43 (1): 59–75. JSTOR 1877926. Paur, Philip (1981). "The Corporatist Character of Bismarck's Social Policy". European History Quarterly. 11: 427–60. Ross, Ronald J. (1998). The Failure of Bismarck's Kulturkampf: Catholicism and State Power in Imperial Germany, 1871–1887. The Catholic University of America Press. ISBN 978-0813208947. Stone, James (2012). "Bismarck Ante Portas! Germany and the Seize Mai Crisis of 1877". Diplomacy & Statecraft. 23 (2): 209–35. Stern, Fritz (1979). Gold and Iron: Bismark, Bleichroder, and the Building of the German Empire. Vintage. ISBN 978-0394740348. Stone, James (1994). "Bismarck and the Containment of France, 1873–1877". Canadian Journal of History. 29 (2). Waller, Bruce (1974). Bismarck at the Crossroads. The Reorientation of German Foreign Policy after the Congress of Berlin 1878–1880. The Athlone Press. ISBN 978-0485131352. Wawro, Geoffrey (2005). The Franco-Prussian War: The German Conquest of France in 1870–1871. Cambridge University Press. ISBN 978-0521617437. Wawro, Geoffrey (2012). "The War Scare of 1875: Bismarck and Europe in the Mid-1870s". German History. 30 (1): 140–41. Wehler, Hans-Ulrich (1970). "Bismarck's Imperialism 1862–1890". Past and Present. 4 8 (48): 119–55. JSTOR 650484. Wetzel, David (2012). A Duel of Nations: Germany, France, and the Diplomacy of the War of 1870–1871. University of Wisconsin Press. ISBN 978-0299291341. Wetzel, David (2001). A Duel of Giants: Bismarck, Napoleon III, and the Origins of the Franco-Prussian War. University of Wisconsin Press. ISBN 978-0-299-17490-3. Cowen, Ron (30 January 2012). "Restored Edison Records Revive Giants of 19th-Century Germany". The New York Times. Retrieved 31 January 2012. Frankel, Richard E. (2003). "From the Beer Halls to the Halls of Power: The Cult of Bismarck and the Legitimization of a New German Right, 1898–1945". German Studies Review. 26 (3): 543–60. JSTOR 1432746. Frankel, Richard E (2005). Bismarck's Shadow. The Cult of Leadership and the Transformation of the German Right, 1898–1945. Berg Publishers. ISBN 978-1-84520-033-6. Gerwarth, Robert (2007). "Inventing the Iron Chancellor". History Today. 57 (6): 43–49. Gerwarth, Robert (2005). The Bismarck Myth: Weimar Germany and the Legacy of the Iron Chancellor. Clarendon Press. ISBN 978-0199236893. Hamerow, Theodore S. (1993). Otto von Bismarck and Imperial Germany: A Historical Assessment (2nd ed.). D C Heath & Co. ISBN 978-0669294446. Müller, Frank Lorenz (2008). "Man, Myth and Monuments: The Legacy of Otto von Bismarck (1866–1998)". European History Quarterly. 38 (4): 626–36. doi:10.1177/0265691408094517. O'Shea, John J. (1898). "Bismarck's Decline and Fall". The American Catholic Quarterly Review. XXIII: 836–851. Pearce, Robert (2010). "The Austro-Prussian War". History Review (66). Russell, Mark A. (2000). "The Building of Hamburg's Bismarck Memorial, 1898–1906". Historical Journal. 43 (1): 133–56. JSTOR 3021016. Steefel, Lawrence D. (1930). "Bismarck". Journal of Modern History. 2 (1): 74–95. JSTOR 1871140. Stürmer, Michael (1971). "Bismarck in Perspective". Central European History. 4 (4): 291–331. JSTOR 4545614. Urbach, Karina (1998). "Between Saviour and Villain: 100 Years of Bismarck Biographies". Historical Journal. 41 (4): 1141–60. doi:10.1017/s0018246x98008206. JSTOR 3020865. Bismarck, Otto von (1899). Bismarck, the Man & the Statesman: Being the Reflections and Reminiscences of Otto, Prince von Bismarck. 1. Trans. A. J. Butler. New York and London: Harper & Brothers. Bismarck, Otto von (1898). Memoirs. II. New York Harper. Hohenzollern, William I; Bismarck, Otto von (1903). The correspondence of William I. and Bismarck: with other letters from and to Prince Bismarck. Trans. J. A. Ford. New York : Stokes. Coveney, Dorothy Kathleen; Medlicott, William Norton (1971). Bismarck and Europe. Hodder Arnold. ISBN 978-0312082253.